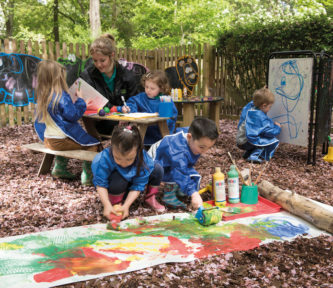 Inject colour and fun into the playground whilst stimulating children's imagination, mark making and creative skills whatever the weather! The giant mark making surface enables children to write messages, stories or develop drawing skills. Set of five wild animal favourites include: elephant. lion, hippo, crocodile and gorilla. Made in the UK from durable, easy clean plastic, pre-drilled for mounting with screws or cable ties. These products look amazing... but that is where the positive review ends. They offer the usual chalkboard problems of being very hard to clean adequately but with the added fundamental flaw of being so easily breakable they may as well come with a recycling box. It is hard to get the cable ties to match up with the holes on the animal and anything but a perfect fit bends the thin foam that they are made from. My first set blew down in some winds that we had, just ripped to peices - TTS sent out replacements very nicely. The second set were already broken in the box, all of the ends had snapped off (probably dropped in transit - TTS sent out another set of replacements (even more nicely) which were slightly damaged but not enough so that I couldn't reinstall them. One week later we are back down to four on the fence (although this time I think a child put their foot through it) - but again that speaks to the durability of the item. In conclusion - If these were cheaper and were intended to be used spread out on the floor (as we now use the broken ones that aren't fully snapped) or possibly if they were able to withstand being drilled into a wall then they could get up to four stars. But at the price, and for the intended use I'm afraid one star is their outcome. The boards were damaged and the quality was not a good as we had expected. The visual images are great. My kids love these chalk boards! They are well made and light weight.